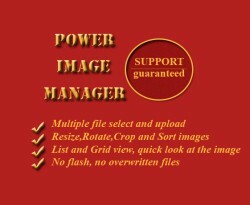 Power Image Manager is PERFECT solution for managing images in Opencart platform. - List & Grid view of files. - Quick look at the image. - Resize, Rotate, Crop images functions. - Uploading files with Drag & Drop (Mozilla, Sfari, Chrome). - Readme.txt included (this file). - Support available by email.